Last week or so I posted a little ditty about quinoa, what it is and how to cook it, etc. One thing most people do with it is to add it to a salad. One of my all-time favorite salads is at the California Pizza Kitchen. Called ‘Quinoa & Arugula Salad’, it’s just as advertised,…only better. This is a light tasting salad with enough protein punch to carry you for hours. 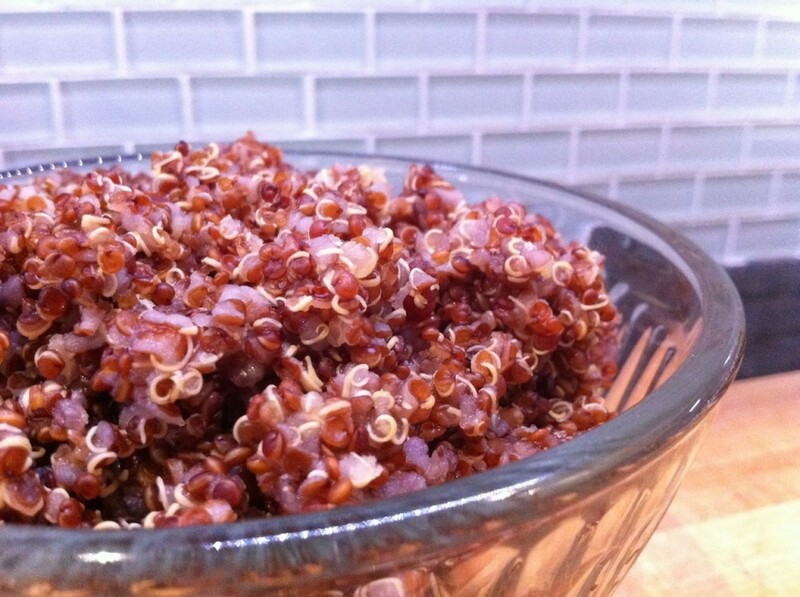 Since I’ve mastered the quinoa,…let’s make some. 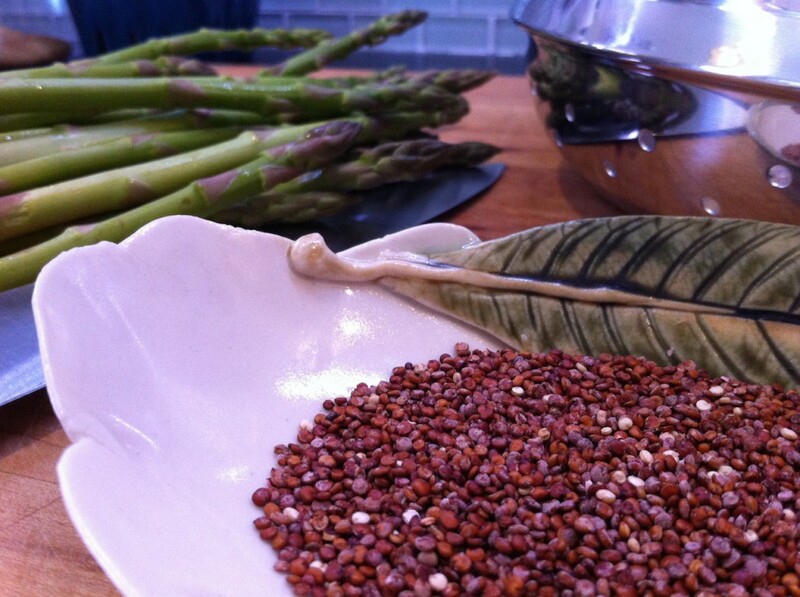 Gather some quinoa to cook up, and asparagus to steam. Check that post from last week on making that quinoa! 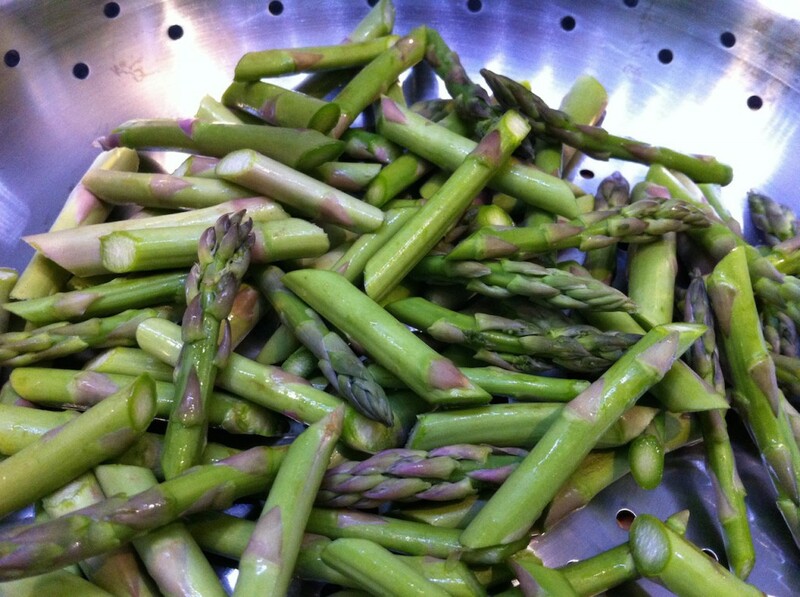 Clean up that asparagus. Bend the end of one until it snaps, then use it to measure where to cut the rest in one whack. 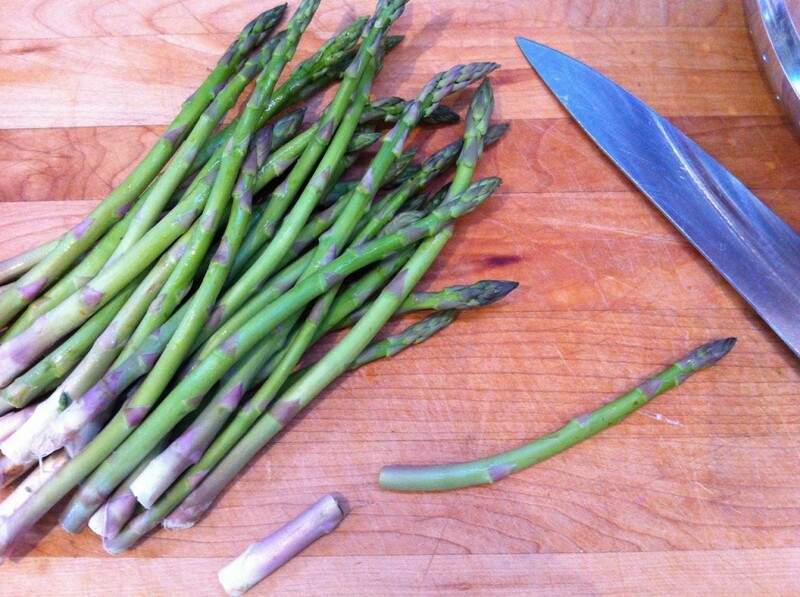 Steam the asparagus. I used a steamer on the stove , but you can use the microwave. To be honest, I let mine cook too long – busy taking photos! Unless you shock them in ice water while they’re cooked, but crunchy, there will be ‘carry-over’. That means mushy veggies. Don’t do it ! Respect the ‘grass. Get it together and whisk to combine. 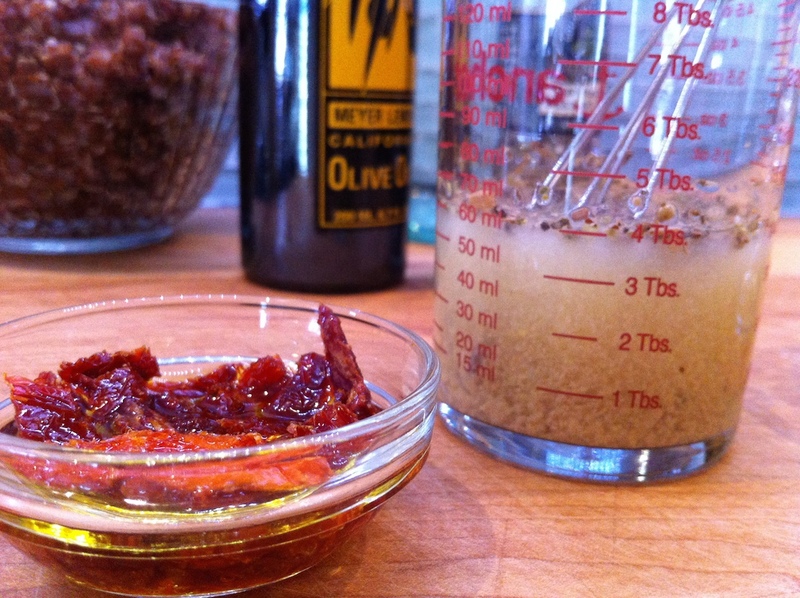 The mustard will help emulsify the mixture. OK, so as a salad, it’s a make as you like deal…but here’s what I did. On a big plate of arugula mix (I love those baby green mixes), drizzle with some of the dressing and toss. 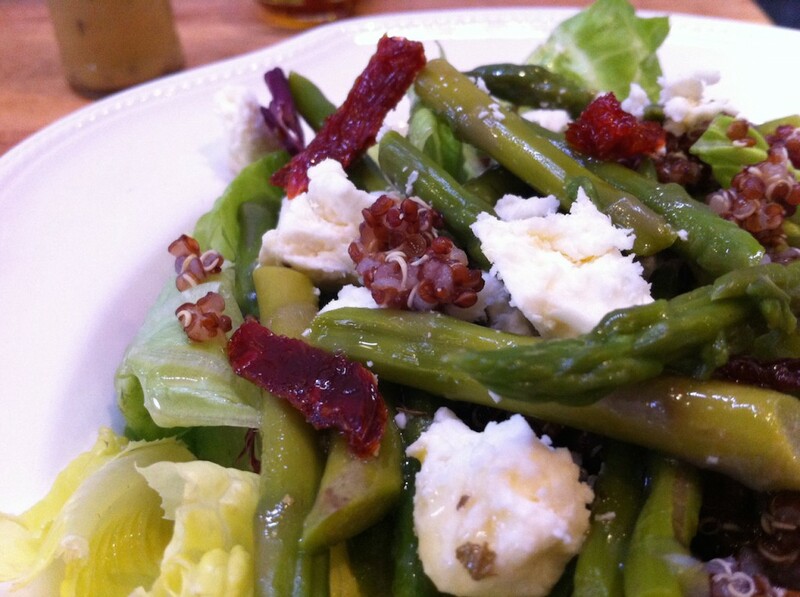 Then sprinkle on about a 1/4 cup of cooked quinoa, 1/3-1/2 cup steamed asparagus, 4 or 5 pieces of sun dried tomato, chopped, a sprinkling of feta cheese AND some red onion*. Note: How to calm down an onion. Ever get those salads and the onion could take your head off? Yeah, me too. Well, at CPK they don’t – why? Are they pickled? No,…it’s a head-slappingly simple trick. Slice the onion thin first, let it float in a little ice water while you put together the rest of the salad. Ta-da! Onion taste that won’t leave you with ‘onion breath’. That’s it – enjoy !! This is even better that I don't have to drive so far to get it ! Get the onions soaking in ice water. Toss the greens with a drizzle of dressing. Top with everything else and enjoy ! Yes, there will be dressing left over. That's ok, because theres all that asparagus to use up - and more salads to make! « What else can I do with Eggplant?